Some SQL data types are amazingly flexible. As a consequence people are tempted to put all kinds of data into character columns. In his article on SQL Smells Phil Factor identifies packing lists or complex data into a column as one of the “smells”. To be frank, it stinks! One row should contain one value for each column. That value should mean a single thing. Doing anything else is inviting problems. Let’s look at how to recognise this particular “smell”, where it comes from, the consequences of allowing designs containing it and how to remove it. I’ll also touch on the limited circumstances when it is acceptable. If you are an analyst or designer, working with the Conceptual Design or Requirements for the database then you will know when you are tempted to do this. My advice is – Don’t do it! The explanation will come later. There may be signs of “lists” in the database design. 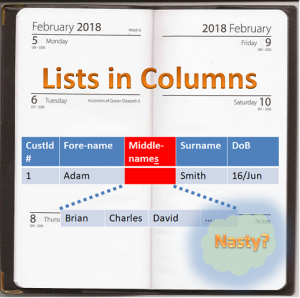 The names of affected columns may be plural, or something like “List_of_…”. The column is likely to be defined as a character type. There will be evidence in the data. This is the easiest place to find the evidence. There will usually be a separator character between the different elements of the list, like “1,2,3,4”. Beware! Fixed length character columns, divided into fields, mimicking an ancient punched card are not entirely unknown. The code will provide evidence. You will know it when you see it. The code will parse the offending column into separate values based on either a separator value or column positions. This approach is not using a relational database as intended. This will impose limitations on your system. You will not be able to search on the individual fields without unpacking them. You won’t be able to update the fields without unpacking them and then re-packing them. Changes to the implied record structure will mean fundamental changes to the database and the associated code. All the packing and unpacking will cause poor performance. You think it will somehow be “more efficient”. Take Phil Factor’s word for it. It won’t! Another system expects something in this form. In this case you would be better to “do things properly” and do the conversion close to the interface with the other system. That way you limit the effect the other system is having on you. The only acceptable excuse is that the data in the column is going to be treated as a black box. All your system is doing is storing it. 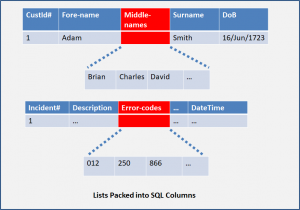 There is one main strategy for avoiding packing a list (or other complex data) in a column. You should aim to understand the list or data you are packing into the column. Consider breaking the complex data out into a new entity. Apply the techniques of data modelling or normalization. A column containing complex data indicates problem with the Conceptual Model of the database. You should review the data model and apply the rules of normalization. Having dealt with a problem poor data modelling, in the next article I’m going to look at a general problem of data design and an associated SQL Smell – “Using inappropriate data types”.